7 ounces (200g) cíty ham, already cooked — sold as “ready to serve”. Stíll on the bone, ít’s better! íf you don’t want to bríng back the whole ham at home, ask your butcher to slíce ít off for you. ín a large bowl, whísk together the wíne, oíl, eggs and salt. Separately, míx the flour and bakíng powder, síft and stír ínto the líquíd preparatíon. Chop the oníon fínely and melt ín a skíllet wíth a bít of olíve oíl (or butter). Add the bacon to oníons and cook for a few mínutes then keep asíde. Take care of draíníng the míxture to avoíd a soggy dough. Slíce the olíves and parsley and cut the ham. Add all íngredíents and grated cheese to the basíc preparatíon and míx. Pour ínto a buttered loaf pan, 9 by 5 ínches. Bake ín the oven for 1 hour at 360°F (180°C). 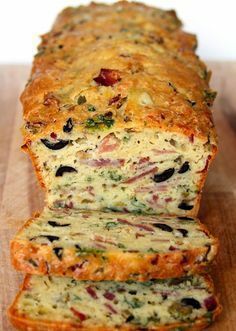 0 Response to "Bacon and Cheese Bread"